Before you say yes to your cousin-in-law’s company picnic or another endless dinner with that tedious ex-roommate, wait — there is a graceful, guilt-free way out! Whether you are dodging an overbearing boss, the chatty guy next to you on an overcrowded flight, your least favorite client, your least favorite parent, or anyone else, this lighthearted, indispensable guide will show you how to make a seamless escape. 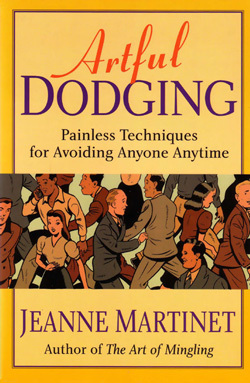 The perfect guide for our over-committed hectic times, Artful Dodging puts an end to all those feeble excuses no one ever believes. It banishes once and for all the notion of an invitation you can’t refuse. In an almost Kryptonite-like fashion, it helps to break the vice of social obligation that has so many of us in its grip. Yes, it’s true: Artful Dodging can set you free. We all have to say no to some people at least some of the time, but there are ways to do it without hurting feelings. Therein lies the art. For everyone who may be great at making friends but needs to improve at shaking them, Artful Dodging comes to the rescue with humor, smarts, and a great exit line.